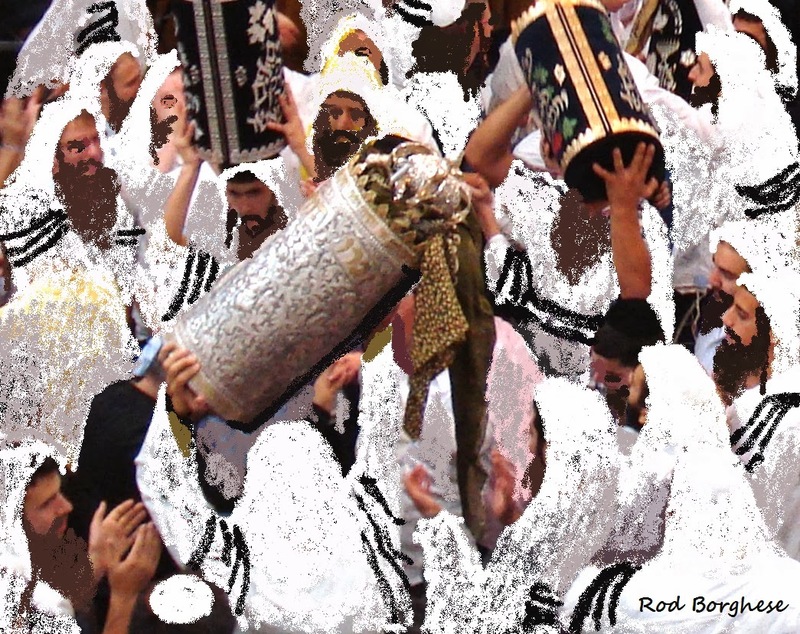 Jewish Jesus - Art Exhibit: Simchat Torah ... Did Jesus dance with the Torah ? Simchat Torah ... Did Jesus dance with the Torah ? Simchat Torah : "The holiday of Sukkot is followed by an independent holiday called Shemini Atzeret. In Israel, this is a one-day holiday; in the Diaspora it is a two-day holiday, and the second day is known as Simchat Torah. This holiday is characterized by utterly unbridled joy, which surpasses even the joy of Sukkot. The joy reaches its climax on Simchat Torah, when we celebrate the conclusion—and restart—of the annual Torah-reading cycle. Did Jesus dance with the Torah ? Maybe. He certainly Rejoiced (Simchat) with Torah. However, if Jesus / Yeshua bar Yosef, was actually born on the 1st day of Sukkot, (in a Sukkah) then 8 days later would have been his Naming Ceremony .... And he was named "Salvation" (YeShVaH) ישועה and on this day his family and friends would begin reading Torah once again.